"Acute flaccid paralysis (AFP) is not a reportable syndrome in California, or any other U.S. state." So states the CDC in the attached document from October, 2014. Before the introduction of the vaccine, anybody with AFP was diagnosed as having polio. "A study examining AFP in children aged <15 years in California during 1992–1998 reported an incidence of 1.4 AFP cases per 100,000 children per year." This was the rate of "polio" cases for most of the twentieth century before the introduction of the vaccine, with the exception of the period where extensive DDT spraying was carried out, 1943-1952. Click here to read the entire report on the CDC website. "Ratner notes that poliomyelitis incidence has increased from the 1957 level in 1958 and 1959, and that SUBSTANTIAL NUMBERS OF CASES OCCUR IN THE TRIPLY VACCINATED. DIFFERENCES IN DIAGNOSTIC CRITERIA for non-paralytic and paralytic cases introduced as a result of the 1954 killed polio-vaccine trial are thought to be the major cause of the fall in incidence of reported poliomyelitis in 1957. The change in 1955 meant that we were reporting a new disease, namely paralytic poliomyelitis with a longer lasting paralysis" (60 days instead of 1 day). Click here to read this abstract of a panel discussion published in the "Illinois Medical Journal" in August, 1960. The five panelists were all deeply involved in the development of the polio vaccine and the study of its effectiveness. "Nine Colorado children have been stricken with muscle weakness or paralysis since Aug. 8." "All nine had... abnormalities of the spinal cord gray matter on an MRI." "Myelitis, an infection or inflammation of the gray matter of the spinal cord, is a rare but not unexpected complication of viral infections." "So far this year, enterovirus 68 has been confirmed in 40 states and the District of Columbia, according to the CDC." Before polio vaccination began in 1954, all these cases would have been called polio. Click here to read the news report from the September 26, 2014 edition of the "Denver Post." "Approximately 95% of persons infected with polio will have no symptoms. About 4-8% of infected persons have minor symptoms, such as fever, fatigue, nausea, headache, flu-like symptoms, stiffness in the neck and back, and pain in the limbs, which often resolve completely." The CDC changed the numbers on their website to make polio look slightly more dangerous. "C.W. Jungeblut received his M.D. from the University of Bern in 1921 and, between 1921 and 1923, conducted research at the Robert Koch Institute in Berlin. After employment as a bacteriologist for the NY State Department of Health from 1923 until 1927, he became Associate Professor at Stanford University from 1927 until 1929, when he joined the faculty at the Columbia University College of Physicians and Surgeons as Associate Professor of Bacteriology. Named a full professor in 1937, Jungeblut retired June 30, 1962. In his day, DR. J was justly regarded as an important player in polio research. His most important discovery: that ascorbate is prevention and cure for polio. Amazingly, Jungeblut first published this idea in 1935. His research on ascorbate was sweeping and profound, extending well beyond the topic of polio. In 1935, he also had shown that vitamin C inactivated diphtheria toxin. By 1937 he demonstrated that ascorbate inactivated tetanus toxin. John T. A. Ely, PhD, writes: 'In the 1930's, the remarkable C.W. Jungeblut, MD . . . first reported that ascorbic acid in concentrations, attainable in humans by a high intake, could inactivate and or protect against numerous viral and bacterial pathogens and their toxins. These include the polio, hepatitis and herpes viruses. . . One of his earliest research findings was ascorbic acid's ability to neutralize and render harmless many bacterial toxins, such as tetanus, diphtheria, and staph toxins.'" Click here to read the entire article with references to Dr. Jungeblut's research. Click here to visit a page on the website of the Rockefeller University Press with links to twenty three of Dr. Jungeblut's published papers. "In the index community, 8 (35%) of 23 children tested, including the infant, had evidence of type 1 poliovirus or VDPV infection. Phylogenetic analysis suggested that the VDPV circulated in the community for ∼2 months before the infant's infection was detected and that the initiating OPV dose had been given before her birth. No paralytic disease was found in the community." 35% of unvaccinated children are found to have the polio virus. Only one gets sick. They all had the vaccine version. Who is at risk of making who sick? What is the real story of polio if ninety percent of those infected are not ill? If they are all getting the vaccine version? Let's dig deeper. Click here to read the study by the CDC published in the "Journal of Infectious Diseases" in February, 2009. "Acute flaccid paralysis (AFP) is the most common clinical presentation of acute poliovirus infection, occurring in 0.1-1% of infected cases." This is within the widely accepted rate of polio virus complications. "Enteroviruses isolated from the faeces of 26 (16%) of the 162 cases were Coxsackie A24, Coxsackie B5, enterovirus 71, enterovirus 75, echovirus 9, echovirus 11 and echovirus 18." This suggests that most cases of "polio" are not associated with the polio virus. "Six of seven polioviruses were characterised as Sabin-like" as in, from the vaccine created by Albert Sabin, the one used in the first world. "Five of these cases were classified as infant botulism, one case as transverse myelitis and one as a focal mononeuropathy." Here we see the active renaming of conditions that would have once been called, "polio" and six out of seven were caused by vaccination. "With the eradication of circulating wild polioviruses, other enteroviruses are being more commonly identified as the cause of polio-like illnesses. In the polio end game, when there is increased testing for polioviruses, it is important to consider infant botulism as a differential diagnosis in cases presenting with AFP." Here we see how eradication of the wild polio virus has little to no impact on the actual illness that shares its name. If we may interpret this summary, it does not matter what causes the illness, so long as we get rid of the poliovirus. Click here to read the abstract of the report by Australian government scientists published in June, 2006 in the "Journal of Pediatrics and Child Health." "As the goal to eradicate wild polio virus (WPV) is approached, outbreaks associated with vaccine derived polioviruses (VDPV) with neurovirulent properties have emerged." So found researchers in the Department of Micobiology, The University of the West Indies. Click here to read the abstract of their study published in November, 2008 in the "West Indian Medical Journal." To sum up, polio eradication campaigns are leading to mutated, stronger polio viruses. What is polio? Is it a virus? A reaction to a toxin? Or is it more complex? Here is a timeline of the historical development of polio. The more you read, the more it becomes difficult to know exactly what polio is. The disease appears to have a relationship with radiation, industrial and agricultural toxins and a variety of viruses. How did it crop up seemingly out of nowhere? Why are so many people with the disease free of the virus and so many people with the virus free of the disease. This timeline and the links to scientific studies, historical sources and more that it provides may lead to more questions than answers. It definitely helps open up the conversation about what polio actually is. Researchers examined forty eight cases of polio. They replaced part of the Latin name "polio myelitis" with English words, calling it instead, "acute flaccid myelitis." This in itself is rare, as the medical establishment will usually take normal English phrases such as "inflamed inner elbow" and translate them into Latin phrases such as "medial epicondilitis." These cases come from two hospitals, which leads to the question of how many more cases there were in that one year period. Estimates posted elsewhere on this site suggest that the rate is roughly what it was before vaccination. The researchers found the virus closely related to the polio viruses. This leads one to wonder if the viruses have been mutating. Elsewhere on this page we share studies discussing the mutated polio viruses. These researchers state that this particular one, entero virus D68, first appeared in 2010. Is this a strain that we caused either in a lab or by accident when we mixed all these highly reactive protein covered dna strands? Or is it a naturally occurring virus that we only recently identified? Or is it an opportunistic virus that was present but recently started taking advantage of the re engineered gut biome? Click here to read the short study, published in "The Lancet" in June, 2015. More people getting polio from the vaccine. Click here to read a report from the CDC from 2001 about three cases in the Philippines. Click here to read a case study of a Japanese infant who was given meningitis by the polio vaccine published in 2001 in the "Scandinavian Journal of Infectious Diseases." "Serial sewage samples were collected in 4 towns of Mexico before, throughout, and after the May 2010 oral poliovirus vaccine (OPV) mass immunization campaign. Sabin strains were identified up to 5–8 weeks after the campaign in all towns." While the authors blame inadequate vaccination coverage and recommend more vaccines, this makes no sense as it was the vaccine version of the virus, shed from vaccine recipients that was found. In India, the rate of paralysis from polio vaccine is about 10 times as high as normal following vaccination campaigns. "The incidence of non polio acute flaccid paralysis (NPAFP) was strongly associated with the number of OPV doses delivered to the area. A dose–response relationship with cumulative doses over the years was also observed, which strengthens the hypothetical relationship between polio vaccine and NPAFP. The fall in the NPAFP rate in Bihar and UP for the first time in 2012, with a decrease in the number of OPV doses delivered, is evidence of a causative association between OPV doses and the NPAFP rate." Click here to read the abstract of the paper published in the February, 2015 issue of "Pediatrics," the leading pediatric medicine journal in the world. It discusses the rise in paralysis directly due to vaccination. It was written by three pediatricians in India. Yet vaccinators claim to have eradicated polio. How is this possible? Click here to read the article celebrating the elimination of the virus and ignoring the fact that the illness is now more common and worse. They eliminated the virus, not the disease. Eliminating the virus led to a ten fold increase in the disease. Here are our thoughts on the matter. There are dozens of types of naturally occurring viruses that have been found and identified in the human gut. There are an unknown number that have yet to be identified. Collectively these are known as entero viruses. Any one of these can be involved in the primary symptoms once diagnosed as polio myelitis. The one currently causing thousands of cases of polio in the U.S. and killing dozens, if not hundreds of kids every year is called entero virus D 68. Only the first three such viruses identified were called polio. After that they just gave them the general classification with a number identifying how many others had been found before it. Of course, they don't call the modern disease polio because the viruses are slightly different from the first three discovered entero viruses, but it is a semantic difference. The illness is the same. There is even a theory that some of these newly discovered entero viruses are mutated versions of the three viruses named polio and used in vaccination campaigns. It is widely recognized that vaccination causes viruses to mutate. Eliminating three of the dozens or more is not useful. We would have to eliminate them all. With what we know about how gut flora play a huge role in life long immune function (see the page on the microbiome), this seems unwise. We are finding more and more information every year about how the presence of viruses in our gut are crucial to life long health and how their absence can lead to a number of strange illnesses, not the least of which is cancer. A comparative consideration of the two studies offered here shows how the attempt to eliminate three of the uncountable entero viruses has caused a ten fold increase in the disease itself, despite success in wiping out the viruses. It is further important to consider that these viruses are not themselves the cause of the symptoms. The theory that they are the cause of the symptoms is over one hundred years old, from a time when nobody had ever seen a virus and nobody ever thought about the neurotoxicity of industrial chemicals. We have progressed much in the past century. We now know there must be extenuating circumstances that allow the virus, naturally present in the intestines, to get into the brain. Historically polio only showed up once we started using lead and arsenic as pesticides in the late nineteenth century and it only showed up in people who were exposed to these toxins. In the outbreak of the late 40s and early 50s the associated chemicals were DDT and similar pesticides. These toxins broke down the natural filters and allowed the virus to get into the brain. This explains why one of the co developers of the polio vaccine, Albert Sabin found in his research in the 1940s that Amazonian aboriginals had one hundred percent polio virus presence and zero symptoms of disease. They had not been exposed to chemical fertilizers so the natural balance had not been thrown off. “In Pakistan, the Bill and Melinda Gates foundation (BMGF) and Global Alliance for Vaccines and Immunizations (GAVI) were blamed on an outbreak of acute flaccid polio has begun to surface in the region and killed ten thousand Pakistani children who were inoculated. The startling revelation is part of an inquiry report prepared by the Prime Minister’s Inspection Commission (PMIC) on the working of the Expanded Programme on Immunisation (EPI). The PMIC, headed by Malik Amjad Noon, has recommended that Prime Minister Yousaf Raza Gilani immediately suspend the administration of all types of vaccines funded by the GAVI." Click here to read this assessment of the polio vaccination drive in Pakistan, from 2012. In this article the paralysis of 71 children is discussed. Notice how the conventional view is uncritically propounded here. As we have already seen, there is no evidence that the vaccine prevents paralysis and here we have a growing body of proof that it causes it. It may be difficult for some to believe the officials are so wrong. Until you know a few officials. Click here to read the article on the website of NBC News, from 2007. "In the poliomyelitis epidemic in North Carolina in 1948, 60 cases of this disease came under our care. The treatment employed was vitamin C in massive doses. All patients were clinically well after 72 hours." Dr. Klenner goes on to discuss polio in great detail as well as some of his work curing such illnesses as diphtheria and others. Click here to read the entire report by Dr. Klenner, as published in July, 1949 in the journal, "Southern Medicine and Surgery." Click here to read an article about Dr. Klenner and some of his work. "Polio eradication efforts have been hampered by low responses to trivalent oral poliovirus vaccine (tOPV) in some developing countries. Since stomach acidity may neutralize vaccine viruses, we assessed whether administration of a buffer solution could improve the immunogenicity of tOPV." Allow us to interpret: Children are not having strong secondary immune responses to polio vaccines. Researchers believe it is because their primary immune responses are effective. They are testing to see if shutting down primary immune response will promote their secondary immune response. To summarize, as we saw above, the vaccine is causing a massive pandemic of paralysis. As we see here, it is not even providing antibodies, a poor measure of resistance to disease yet the gold standard for vaccinators. Yet the vaccinators still refuse to consider their theory wrong. Instead they push ahead with new attempts to engineer better humans. They are beginning with the assumptions that humans are faulty and they must engineer us to be better. Click here to read the abstract of the study, from the November, 2014 issue of the "Journal of Infectious Disease." The really shocking thing is the way the researchers are trying to re engineer something that is already working. Here is a discussion about the polio vaccination campaign from the Chicago Tribune, from March, 1961. It was not all peaches and cream. Notice how all the actual information given reflects very negatively on the vaccine. The only positive things said are unsupported statements made by doctors, a number of whom had financial interests in the issue. It was redefined, making it appear cases decreased, even though cases of paralysis increased, especially in the fully vaccinated. The vast majority, around 99.9% of the people with the virus do not have the disease. Even fewer experience paralysis. One of the doctors on the panel who has a vaccine of his own that he is trying to sell admits that protection from vaccines won't last long, but that is okay because it will be cheap enough that everybody can take the vaccine once a year. They emphasize that they have no good data to show the vaccines are effective. Instead they rely on antibody count. They acknowledge that they do not know what antibody count is needed to provide protection, and half the kids vaccinated have no antibodies at all. We now know that antibodies do not protect against polio. Despite all the negative results of vaccination that they readily admit, despite acknowledging that they do not know if the vaccine works, and acknowledging its dangers, despite recognizing that polio is incredibly rare, they all recommend vaccinating. Click here to read the thorough, informative article from the March, 5th, 1961 issue of the "Chicago Tribune." Consider these historical facts as you read more about polio throughout this website. They mandated that all suspected cases of polio had to be sent to the CDC for final testing and analysis, and that only they could officially diagnose a case of paralytic polio. No more field diagnoses. 1. A pesticide common in the 1800's was called Paris Green. A green liquid because it was a combination of copper and arsenic or lead and arsenic. Some of the most toxic substances known to mankind. 2. This pesticide worked by causing neurological damage in the bugs. 3. Polio consists of symptoms synonymous with neurological damage. 9. President Roosevelt became paralyzed over night while on his farm in the summer. which contained many crops, including apple orchards. 11. According to the Bureau of the Census historical data polio incidence from 1912 to 1942 was a couple cases per year per hundred thousand people. In 1943 incidence began to rise in precise correlation to the use of DDT and similar pesticides. When those pesticides were phased out, incidence of "polio" faded in precise correlation. Click here to watch a video of children being sprayed with DDT in swimming pools, school cafeterias and more. 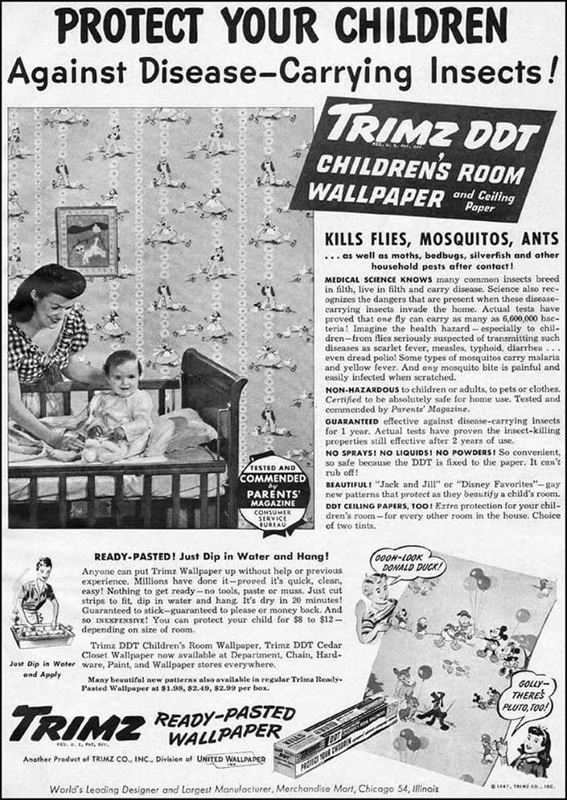 Click here to read an historical review of the widespread use of DDT at the time of the polio scare and vaccination campaign. It includes a number of advertising materials and a great deal of data and links for further study. Click here to read about the symptoms of DDT poisoning. "Thus we find that the cerebellum and the spinal cord are especially affected by DDT." Click here to read a fascinating historical account of the correlation between "polio" and pesticides. It includes the story of Dr. Biskind, an early public health advocate who was widely respected for his research into the dangers of these pesticides, until the polio vaccine movement. This article is thoroughly researched and sourced. "DDT has since attained world renown as the “miracle” insecticide. Beyond question, no other substance known to man was ever before developed so rapidly and spread indiscriminately over so large a portion of the earth in so short a time. Although DDT produces serious functional and morphologic changes in virtually every organ of the body, among its most disturbing and debilitating manifestations are those of the nervous system." Click here to read the entire article by Dr. Biskind and his colleague, Irving Bieber, M.D. from the "American Journal Of Psychotherapy" published in 1949, five years before the polio vaccine was completed. "Five of the six children of an Akron family had their tonsils out one day last summer and within 48 hours all five came down with infantile paralysis. Three of them died. The sixth child did not contract paralysis. There had been no epidemic of the disease in Akron and none followed." Click here to go to Time Magazine's article from 1942. "Last week the A.M.A. Journal called the attention of U.S. family doctors to growing evidence that polio victims who have lost tonsils, adenoids, or both, at any time in their lives, are more susceptible to bulbar and bulbo-spinal attacks." Click here for the Time Magazine article from 1954. There are dozens of known causes acute flaccid paralysis (afp). This symptom was once universally diagnosed as polio. The decline in cases and deaths from "polio" is due to the fact that, while before vaccination began in 1955, all one needed to receive a diagnosis was the symptom afp, since that time it is necessary to find the polio virus. Pubmed's earliest citation on polio, from June 7th, 1879. Click here to read the entire article from the June, 1879 issue of the "British Medical Journal." Cases of polio numbered in the dozens until 1910, when they began to number in the thousands. Or so claimed Dr. Frederick Batten in 1911 in the Proceedings of the Royal Society of Medicine. Click here to read his entire 29 page report. Or whichever portions you choose. This report was found on the website of one of Australia's top universities. "On several occasions, critics have claimed that the theory has been refuted. The Wistar Committee in 1992 said the death of a British sailor in 1959, whose tissues later tested positive for HIV, made the theory implausible. However, several years later, more sensitive tests showed no HIV in the tissues. To help rectify this situation, key documents presenting the theory and commenting on it are provided here. Also given is a list of publications about the theory. This material is provided by Brian Martin who as a social scientist has been following the origins debate since 1991." Click here to visit the website of the university, read the entire analysis, and access the copious links to further information.